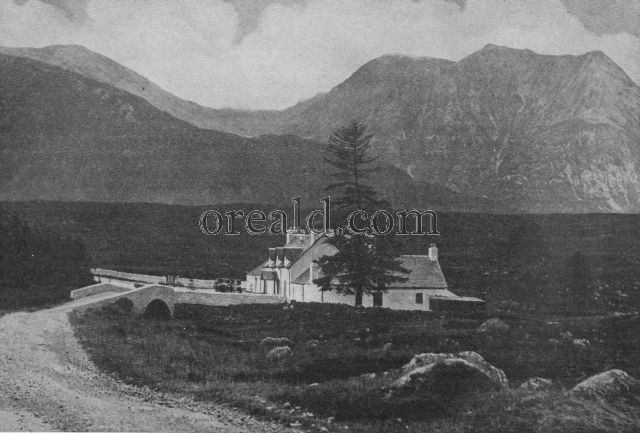 Glencoe to-day is a place of mist and storm, a valley to which brooding mountain heights and a few melancholy pines impart a strange air of tragedy and sadness, apart from its association with one of the foulest deeds in history. The victims of the famous massacre were, according to Macaulay, only thirty-eight members, men, women and children, of Clan Macdonald; but the tale of vilest treachery and blood lust has left an ineffaceable impression. Kingshouse was established as a military outpost in King William's reign.